In pre-Petrine Russia, most used clothing remained the coat - double-breasted clothing large polutanata and extra long sleeves. She was found spread among the various sectors of society. Form-fitting and the appointment was determined by the name: home Kaftan, output, main, driving, cold, rain, etc. around It were trimmed with colored braid, gold or lace. The front is fastened with buttons and buttonholes, decorated with tassels. Could be worn unbuttoned. The pockets were not (Fig. 7). To the ruling classes, the coat was sewed from high quality materials - silk, brocade, velvet, and was decorated with expensive embellishments of pearls and precious stones. The poor were made of cheap cloth, krashenina, calico, and the poor - from the canvas and sermyaga. I must say that the caftan in the nation lasted until the early twentieth century. 3ипун - like coat, but narrow, almost tight, with sleeves of cloth of another color or without sleeves. It is most often worn with a belt. This includes feryaz, doradca, kabini, Apuseni and coat. Feryaz - long, tight-fitting clothes decorated with stripes, no collar, with sleeves or without them. Doradca - a kind of ferazi. Have worn in cold and inclement weather. Haben s - year-old long clothes with holes under the sleeves for threading hands. Themselves sleeves hanging on the sides as decoration. Wore kabini in sleeves and saddle stitch, putting on over ferazi. This clothing, depending on income, was made of cloth, wool, satin, velvet, brocade. Headdress the man was a cloth, velvet or brocade cap, which in winter lined with fur. 1 Peter hated the pomp and pretentiousness of contemporary clothing, holding a different kind of reform, distributed them to her. He commanded to exclude many irrational elements. Further innovations have opened Western styles broad street in Russia. As noted later known Russian historian Vasily Klyuchevsky, Peter "wanted to shave and dress their subjects in foreign, in order to facilitate rapprochement with foreigners". Replacement vintage costume fashion wore coercive. Decrees of Peter the 1700 - 1701 years vasimalai "with drum battle on the squares and streets". In case of disobedience introduced the fines, were cut and torn to pieces long floors of feryazyah and ignorados. The middle of the SEVENTEENTH century was the beginning of a new era not only for European but also for the Russian clothing. Its fundamental difference from the past is a big rationality, defined aesthetic expression, an approximation to the silhouette, corresponding to a human figure, a variety of forms. In the Russian women's clothes, have a variety of sundresses. Soon they were replaced by sweatshirts, shoshoni and skirts. For walking and horse riding are designed women's sartucci with a short bodice. To cartucce wear kimzolciak. Morning outfit are the skirt and jacket. 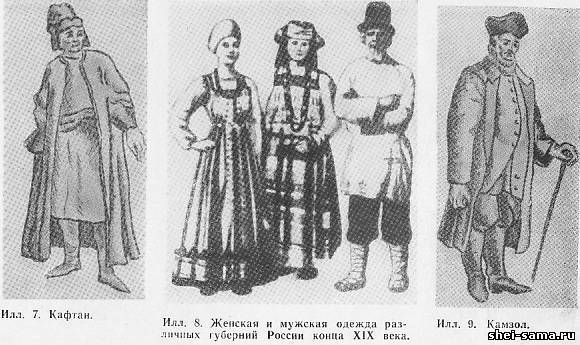 In almost every province of Russia had their own distinct clothes. National features are gradually changing, not only in cities but also in villages. Making headway diverse range of dresses with a wider color gamut. It would however be a mistake to assume that Western suit replaced the Russian historical or aesthetic merits of the first the second put at a disadvantage. In any case! The fact that the changes touched mostly the rich class and the bureaucratic world. Russian people in General remained faithful to their national traditions and, if you made changes to the clothing, with strict regard to the feasibility and rationality of them, with great taste and tact while maintaining the age-old aesthetic traditions. An example here can serve the peasant woman's clothing, preserved until the beginning of the twentieth century. Depending on regional characteristics and the degree of development of material culture, it was divided into southern Russian, or yuzhnovelikorusskie, and North-Russian, or severobaikalsky (Fig. 8). However, the other was characterized by high artistic taste, originality of forms and lines, lack of depressing monotony. Whatever the instance, the individual style of masters, for the Russian women loved my dress and when it was made, showed a truly fabulous imagination and creativity.A variety of style, pattern, color, they still surprise with their originality, blend of old traditions with new, strict harmony of clothing and the rural landscape. Art patterns reflects the images associated with the change of seasons and even crops. Special an abundance of embroidered and woven patterns inherent in the dresses for Sunday, harvest and patronal festivals. These ornamental motifs has acquired a purely decorative nature of the still widely used by our and not only our fashion designers to create modern clothes with Russian folk motives. Of course, urban fashion had an impact on peasant clothes, and she gradually gains new features. Women's costume now consists of a one piece dress or a set - top long straps and jackets with puffed sleeves. More rich are all kinds of add-ons and accessories - scarves, embroidered with gold, colorful scarves, a variety of earrings. Around 1820 there were boot above the ankle. It is made of twill ash or black color and on the front toes leather. Simple Russian woman looks in these clothes, more colorful, more picturesque than before. At the same time, whatever she wears (first everyday dress) are perfectly adapted to the work, customized to the shape, as it emphasizes it. An entirely different process occurs with women suit secular society. He continues to gravitate to Western European samples. And indeed fashion is changing more than people. Idle and empty society leaders finds this quick change of robes, the main contents and the meaning of life, is not burdened with any other concerns. To show off in the cabin of sovereign Countess, to outdo so-and-so and such-and-such a lady - that's what most are worried about these bums on each day and night worked for hundreds of people. Extravagance, exclusivity at any cost - were ready for this even to make flour, to forget the shame. So, they were wearing corsets, which were made from thick rows of sticks, made of whalebone. What they were to do with the fact that this "invention" of the past centuries have served in their time an instrument of torture? They didn't care even then, it's the product of a perverse taste, really, worn primarily on ceremonial occasions, squeezing the mill, incredibly mutilated it beyond recognition changed the silhouette of women and adversely affects her health.Eccentric succumbing to bad influences of the European hypnosis, secular women imagined that a corset gives them a lovely, though actually they are because it lost simplicity and natural grace.